V.A.Whitley are proud sponsors of the Fry Magazine Awards which were launched online at frymagazine.com and through the pages of Fry Magazine in 2012. 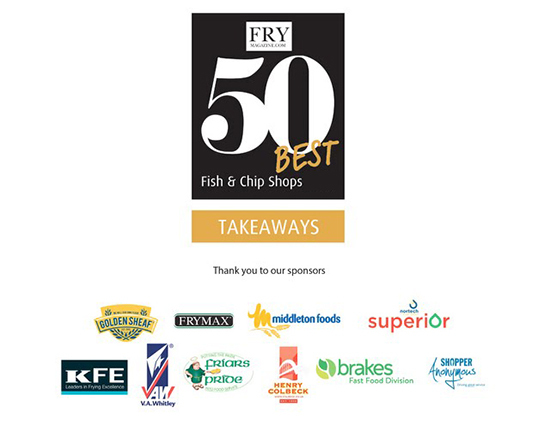 The UK’s 50 Best Fish & Chip Shops, 10 Best Restaurants and the 10 Best Mobile Units categories are tasked with simply finding the UK’s very finest fish and chip shops as judged by mystery diners. There is NO PAPERWORK judging, simply book your slot that will take you less than 2 minutes and one of our awards team will contact you for your shops details you would like mystery dined. Shops enter anonymously and in complete confidence as Fry Magazine do not publish the entries list. ALL the entries undergo a mystery dining visit from ‘Shoppers Anonymous’ a Nationwide and independent company. This ensures all shops and mobile units of all sizes and turnover get the same equal opportunity to showcase their great British fish & chip offering. Shops are judged simply on front of house, food quality, service and the overall customer experience. All shops and mobile units that enter get their actual mystery dining papers sent to them so they can evaluate and improve their business for total transparency. The Top 50 scores are the ‘’50 Best’’, top 10 scores make up the 10 Best Restaurants of that category and the top 10 scores make up the 10 Best Mobile Units of that category. The winners each receive a winners certificate, and A2 Window poster to display in their shops or mobile units and the results will be covered extensively both online and within the magazine. The biggest benefit to your business will be the coverage gained within local press which from past winners has led to increases of over 50% in turnover! The 2019 Competition is open between the February 2018 - October 2018. After this date Fry Magazine cannot accept your entry. - You can only enter ONE SHOP PER CATEGORY. - If you own multiple sites or are a group or chain, you may only enter 2 shops maximum. One in each category. If you own multiple mobile units you can only enter ONE UNIT. - If you are entering a mobile unit, you must have a fixed and regular route. We will contact you for the route and various days you can be visited to conduct the mystery dining. - Please do not enter more than one shop you own into a category as we will not allow your shops to be put forward. - To be judged on the restaurant category you must have a minimum of 16 covers/seats. - Please fill in your details correctly, we use these to contact you about the shop you want to enter. - Each and every entry will receive their mystery dining report. - You are entering anonymously and in confidence, we do not disclose the shops or mobile units that enter or share your reports. - On entering you can be judged anytime between the date you enter and January 2019.